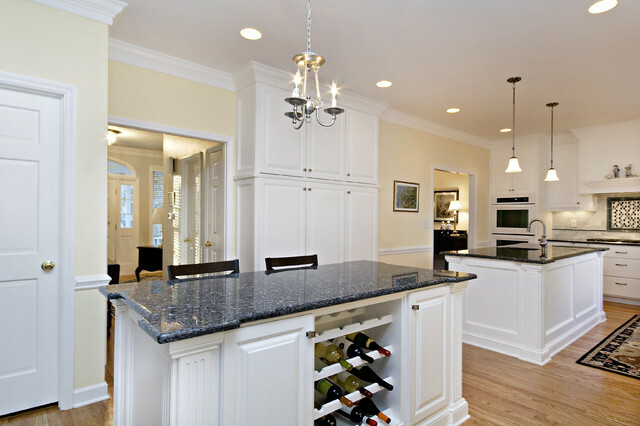 White cabinetry is always classic and this beautiful remodel completed in Durham is no exception. The hardwood floors run throughout the downstairs, tying the formal dining room, breakfast room, and living room all together. The soft cream walls offset the Blue Pearl granite countertops and white cabinets, making the space both inviting and elegant. Double islands allow guests to enjoy a nice glass of wine and a seat right in the kitchen while allowing the homeowners their own prep-island at the same time. The homeowners requested a kitchen built for entertaining for family and friends and this kitchen does not disappoint. What brand/color is the "cream butter paint"? Thanks - the white appears to match your appliances wonderfully also. Beautiful kitchen! We just remodeled our kitchen using yours as our "DREAM KITCHEN" inspiration! THANK YOU SO MUCH for posting this online, as it made all the difference in the outcome of our project! Thanks for your question. The granite is blue pearl.